Just to let you know I had a fantastic time at the reservoir today. The fishing was hard with very little showing on the surface. I managed to pick up a few small trout as I walked around the far shore but nothing big. Just as I thought that it wasn’t going to be my day, I saw a small swirl at my bob fly and then found myself fighting one of the Glengavel monsters. After a fight of about 5 minutes I managed to land a trout of at least 3lb. Well pleased with myself, I wandered back to the boathouse to boast about my triumph. After a cup of coffee (thanks Billy).I started fishing again. With not much happening, I thought I would take a boat our for a couple of hours. Alan Tipple joined me. We had a couple of drifts near the boat house but with no luck so we decided to go right up to the top where the river flows in. On the first drift I got another gentle tug and before I knew it I was in to another huge fish. When we finally got it into the net it was at even bigger than my previous fish, well over 4lb. Another couple of small fish were caught before we headed back to the boathouse. All fish were returned safely, so they’ll be waiting for me for next month’s competition. 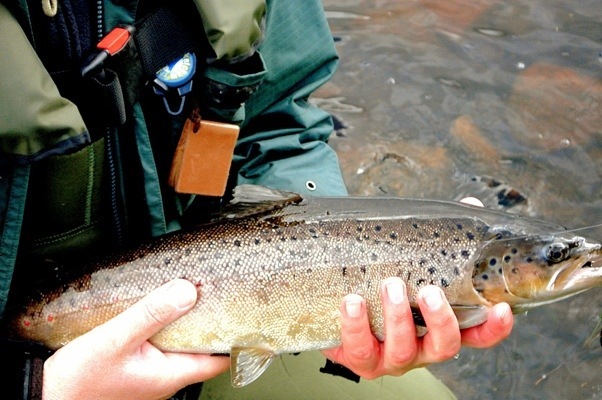 This entry was posted in Sport and tagged Angling, Fishing in Scotland, Glengavel Reservoir Upper Avon Angling Association Strathaven Fly Fishing Brown Trout Lanarkshire Scotland, Strathaven. Bookmark the permalink.